Kuleana, set in and filmed in Hawaii, hits theaters March 30th and is about a disabled Vietnam vet who rediscovers the Hawaiian warrior within to protect his family, defend their land, and clear his father's name. Written and directed by Brian Kohne, the film features Kristina Anapau as Rose Coyle. Kristina Anapau is an actress, writer, and producer. Born in Hawaii, Kristina Anapau spent her youth studying classical ballet, music and theatre. She graduated from high school at the age of 15 and, that same year, began her studies at The University of Hawaii. With dreams of pursuing a professional dance career, Anapau's life would soon take a fateful turn, as she was cast in Universal Television's, Escape from Atlantis (1997), landing her first professional starring role at the age of 16. Soon after, she relocated to Los Angeles where she continued to work steadily, both theatrically and commercially. At age 20, Kristina landed a recording contract with Hollywood Records and spent much of that year recording an album and opening for Destiny's Child on MTV's TRL Tour, but her true love and passion remained performing in film and television. She acted alongside Golden Globe winner Diane Venora and Greg German in ThinkFilm's independent feature, Self Medicated (2005), winner of over 35 international film awards. Anapau starred with Christina Ricci and Jesse Eisenberg in the Dimension Films' thriller, Cursed (2005), directed by Wes Craven, and shined as "Cassie Merteuil" in the Sony Pictures/Newmarket Films release, Cruel Intentions 3 (2004). She appeared in the films, Madison (2001), starring Jim Caviezel and Bruce Dern, as well as, the Lions Gate comedy, 100 Girls (2000). Anapau recurred on the hit HBO series, True Blood (2008), as the enchanting Maurella. She played "Galina" in Darren Aronofsky's Black Swan (2010), in which she acted opposite Oscar-winner Natalie Portman, Mila Kunis, Winona Ryder and Barbara Hershey. In her spare time, Anapau enjoys skiing and horseback riding. She has been a contributing editorial writer for The Standard Magazine and The Hollywood Film Journal among others. Anapau is a graduate of Skidmore College in New York. We had a chance to speak with her about the film. TMS: The film tackles many serious subjects but it does so without shoving them down your throat. I imagine that was part of the appeal for you – being in a movie that’s both educational and entertaining? KA: Kuleana was definitely an education in Hawaiian history for me. in 1971, when the film takes place, the ‘Hawaiian Renaissance’ still had not happened – meaning ancient Hawaiian values and customs were near extinction, Hawaiian was no longer taught in schools, etc. It’s certainly one of the most meaningful projects that I have had the privilege to be a part of. TMS: Could you relate to the story in Kuleana? KA: The undercurrents of the story deal with such fundamental aspects of the human experience, that I couldn’t help but relate – I think most people will in one way or another. I saw a lot of myself in the character, which made for a wonderful, explorative journey while preparing. I’ve always felt that it’s more the roles that are choosing you rather than the other way around. There always seems to be some aspect of myself that gets explored during the preparation and filming process that needed to be examined somehow - and would not have been if not for that role. TMS: Let’s get backtrack a bit, how did you get the role? KA: The director of Kuleana, Brian Kohne, and I first met back in 2011 at The Big Island Film Festival. I was receiving an achievement award, and his film had just won the grand jury prize. He sent me an earlier version of the Kuleana script and I knew right away that I had to be a part of this beautiful film. That initial script was so moving, and to see it evolve over the next few years into the one that we shot with was incredible. With each draft, I remember thinking that it couldn’t get any better, but it did – Brian put his heart and soul into this project and the result is breathtaking. TMS: Tell us about Brian’s approach to writing strong young women. The women in the film might even be sturdier than the men in this case. KA: Most definitely. Brian is very gifted at tapping into the strong, feminine, life-giving force in the world - and somehow getting it onto the page in such a beautiful way – his female characters are absolutely reflections of that. It was such a pleasure to have the opportunity to step into the soul of one of them. TMS: We’ve heard good things, but how was your experience working with Brian? KA: Collaborating with Brian has been an incredible experience – he had a very clear vision for what he was creating, and really loves every step of that creative process. You can’t help but be inspired to delve in to that experience with him - it was such a pleasure to help bring his vision to life. TMS: And you got to go home to film the movie!? How was it being back? KA: Well, it’s always wonderful to go home. I grew up on Hawaii Island (we filmed Kuleana on Maui), so it’s great to have a professional reason to be there for that long a period of time – and to explore Maui! TMS: Does Hawaii recognize you? Do they welcome their resident big screen star home? KA: I don’t ever get recognized and I love that. I was on the front page of my hometown paper a few weeks ago – huge photo of me and article on Kuleana – and when I was in town the following week and not one stranger said anything. It might be because when I’m there I don’t wear any make up, and have the same sweats on every day – much different from what anyone sees on screen or in the media. 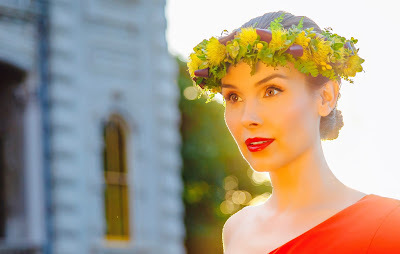 TMS: Is it fair to say Kuleana is one of your first lead roles in quite a while? Did you take time off? KA: Yes and no. I’ve been very focused on writing and producing. This past year, I co-created and am producing a kids show with award-winning talk show host John Kerwin. It’s essentially The Tonight Show for kids. We have all the stars from Disney, Nickelodeon, and more – these young stars have huge followings, but there weren’t any glamorous, late-night style platforms for them. So we created one. Kids in the audience. It’s a lot of fun. The show has been airing nationwide on DirecTv and is doing really well. So well, in fact, that we are in the final stages of doing a deal with a much bigger network – that acquisition will be officially announced in a few weeks. Follow us on Instagram @johnkerwinkidsshow to find out more! TMS: Have you been keeping up with the reviews and what others are saying about the movie? KA: I have been – the interest and support in our little film has been amazing – I feel really privileged to have been a part of something that seems to move people the way Kuleana does. TMS: Are reviews as important to those in the film as they are those that made the film? KA: I think they are more important to those who made the film and rightly so – the investment one makes as a writer, director, or producer is far greater and goes on for a much longer duration than that of an actor. TMS: For those that have never been to Hawaii, can you see Kuleana convincing them that it’s time to go? KA: Well, I don’t know how similar 2018 Hawaii really is to 1971 Hawaii, but it certainly just as beautiful now as it was then. 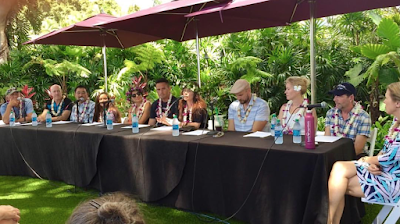 The film will definitely give future visitors a much deeper appreciation for Hawaii and it’s culture.